Banksy’s prank on the art market rhymes with our common struggle against financialization’s shredding of society. Banksy’s latest art prank, in which one of his iconic works shredded itself after being won at auction, has enthused many of us who have been following the depravities of the art world for some time. The artist’s antagonism towards the elites who buy and sell contemporary art is well known, and this stunt comes almost a year after the world record was set for the auction sale of Salvador Mundi, allegedly by Leonardo Da Vinci, for a jaw-dropping $450,312,500 - sold by a notorious Russian oligarch to a member of the Saudi Royal Family. At a time when spoiled billionaires seem to get anything they want, Banksy’s act of vengeance can appear deeply satisfying, but there is more going on here than a simple loathing of the rich and powerful. In my recent book Art After Money, Money After Art: Creative Strategies Against Financialization I argue that the fate of art is a bellwether for broader trends in society, trends that affect not only artists but practically everyone else. The primary trend is financialization. Usually this term is taken to refer to the increased power and influence of the financial sector: big banks, hedge funds and other firms in The City or on Wall Street. Even before these institutions started using algorithms and AI to automate the trading of assets (which include things like the world’s food supply) this industry had already created havoc in the global economy by transforming it into a kind of casino. But the notion of financialization also speaks to the way in which nearly everything in our society is being transformed into a means for someone to make profit, or reformatted as if they were corporate products. Even public services like education, health-care and anti-poverty initiatives are managed and spoken of as if they are ‘investments.’ Young people are increasingly taught to see themselves not as the next generation of citizens but as private speculators improving their human capital to compete on the job market. Housing has increasingly come to be seen as a private means of securing wealth for tomorrow and hedging against future economic uncertainty in a world where few forms of collective insurance (such as state-backed programs for social welfare) remain. In the financialization of art, then, we see a grim reflection of wider trends. It’s not simply that art has become the plaything of a financially-engorged global elite. After all, even in the Italian renaissance, the Dutch Golden Age or 19th century Paris, rich patrons and benefactors have always shaped art markets. Today, however, the influence of fast money on art (and everything else) is more profound and penetrating. Over the past 20 years, a whole array of intermediaries have emerged to help transform art into a purely financial asset. These include art investment funds that allow wealthy people to buy art for speculative future returns; the mushrooming of secretive and hyper-secured Freeport facilities in Switzerland, Singapore and elsewhere where investors can stash their masterpieces in climate-controlled vaults, the better to buy and sell their rights to ownership or hide these assets from taxation; and a wide range of institutions (like the world’s leading insurance brokers) and startups who jockey to provide services to those who leverage art as a special asset class as part of a carefully counterbalanced portfolio of mega-wealth. The accelerating speculation on the financial value of art has led to a rise in demand for new saleable works, since many of the old classics have already been snatched up. This has led to all manner of aesthetic pathologies and the rise of whole new genres of art like the notorious “zombie formalism” of 2014 - a term introduced by art critic Walter Robinson to describe the inoffensive but technically proficient work of a set of very young American artists (all graduates of extremely expensive art schools) who rocketed to market success as speculative bonbons of the plutocrats. As a staunch anti-capitalist and someone who is generally more interested in protest banners than artistic canvases, I couldn’t care less about the fate of ‘great art’ under financialization. What’s more important are two things that this process is teaching us about the societies in which we live. First, art offers us an excellent example of the ways in which almost any social institution can be financialized, even something as obscure, diverse and just plain weird as art. Historically art markets have been notoriously opaque and cliqueish, and the trends and currents of artistic fashion and innovation are, by their very nature, delightfully unpredictable, fickle and arcane. A century after artists like Duchamp’s Fountain - where a everyday urinal was transmuted into ‘art’ by the magic of the artist’s signature - art is everywhere and nowhere, taking the form not only of paintings and sculpture but performance, text, concept and even participatory activities. That our financialized economic system can so thoroughly conscript and subsume art into its operations should give us pause for thought. In this context everything of potential future value is transformed into an asset to be leveraged, and one in which we are each, no matter how humble our means, tasked with becoming a miniature financier. We have learned to see our education, housing, skills and even personal relationships as investments to be put into play, to see all aspects of our life as a terrain of lonely competition. Take, for example, the rhetoric that surrounds visual art classes for children: these are typically presented as an ‘investment’ in the skills, capacities and cognitive development of the child as a future worker or economic agent. Secondly, almost 20 years ago the noted British cultural theorist Angela McRobbie observed that, in post-industrial societies, artists were increasingly being held up as the “pioneers of the new economy” - new model workers for a neoliberal age of freelance, temporary, part-time, episodic careerism in which people must compete for gigs by leveraging their own passions, connections, determination and personal portfolios. In the intervening years Richard Florida’s notion of the “creative class” has dramatically influenced policy-makers and urban planners around the world who imagined that attracting and retaining artists, designers and other ‘creative’ workers would raise the fortunes of struggling economies and communities. ‘Creative destruction’ and ‘disruptive innovation’ became keywords for the rapaciousness of financialization as it tore apart whole industries in search of short-term profit. While in 1968 the slogan “all power to the imagination” was a radical threat to capitalism, by the mid-2000s it was a corporate rallying-cry, with tech firms leading the way in redesigning managerialism around the excitement and elicitation of their employees’ creativity. Ultimately, financialization names a moment when our imaginations have been turned against us. We are increasingly exhorted to orient our creative powers towards the tasks of economic survival - juggling debt, precarity and anxiety while trying to leverage anything we can to stay afloat or get ahead. What is missing is the broader, radical imagination: the possibility of questioning and reformulating our societies and economies altogether. While individualized, quarantined, competitive creativity is valorized everywhere, collective or social creativity - the creativity that would allow us to transform our lived reality together - is increasingly foreclosed. Banksy’s self-annihilating work reflects this condition. Accusations that it was self-serving because it potentially increased the future sale price of the work seem to me to be in bad faith: first, Banksy is already rich and has had many opportunities to get richer if he wants to. 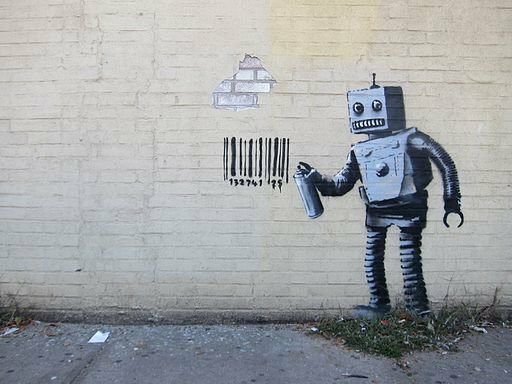 Second, the piece had already been sold for the hammer price: even if Banksy were the seller (which is unclear) he would (except in certain jurisdictions) not see any profits from the future resale of the work. But that doesn’t change the deeper fact that the hyper-financialized art market has refined its methods for generating speculative value out of anything, even acts of defiance. To my mind, we can read this intervention in several ways. On the one hand, it can be seen as emblematic of a certain kind of nihilistic self-loathing: the artist destroying their own work as a pyrrhic but ultimately harmless gesture of cynical defiance. There but for the grace of god go any of us. On the other, it can be seen as an invitation to ask much deeper and more profound questions: if the financialized economy that is so sickeningly reflected in the art market depends on putting our creativity to work, then what if we were to withdraw those services? How can we strike, and strike back, against a financialized order where even our defiance can become an object of speculation? To what other ends could our imagination, individually and collectively, be put?